Gareth Jelleyman (left) in action for Boston United. Whittlesey Athletic manager Andy Lodge reckons he has made one of the signings of the season already. Former Posh full-back Gareth Jelleyman will play for the local side in their first-ever season in United Counties Division One. Tom Flatters has moved to Whittlesey from Netherton. The 35-year-old will play as a central defender for Whittlesey and Lodge is completely unconcerned that Jelleyman’s debut came in an 11-2 friendly defeat at St Neots on Tuesday (July 5). “We were playing a team from three steps higher than us,” Lodge stated. “They had two teams available whereas I was missing a couple of players. It was a bit of a reality check for us, but it was still a worthwhile exercise. “The experience of playing a quality side at a ground with terrific facilities will stand us in good stead. “Anyway I don’t take a lot of notice of pre-season results and Gareth’s performance confirmed to me that he will be a top signing for us. He’s rusty as he hasn’t played for a while, but he showed flashes of quality and experience. “He’s a leader so I believe centre-back will be his best position. Jelleyman played 125 times for Posh after making his debut in January, 2000. He also played for Boston, Mansfield, Rushden, Barrow, Boston United and Corby. 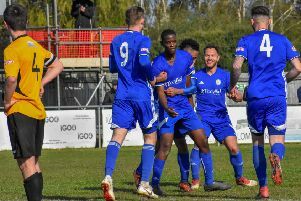 Another former Posh player,Daniel French, will also be involved at Whittlesey this season and Lodge is hopeful of adding two more new signings to his successful Peterborough League squad before they start their United Counties campaign at Long Buckby on Friday, July 29. Whittlesey are at Peterborough Premier Division side Netherton United for a friendly at the Grange tomorrow (July 9, 3pm kick-off). Netherton opened their friendly programme with a creditable performance at United Counties Premier Division side Yaxley on Tuesday. Lee Clementson scored the goal for the city side in a 2-1 defeat at In2itive Park. Netherton have lost tricky winger Tom Flatters to Whittlesey, but former manager Dan Gilbert is back at the Grange. He is assistant to boss Jon Harrison following the premature retirment of local legend Ronnie Fortune.